Fancy a weekend or day's worth of guitar playing and tuition with Total Guitar's Senior Music Editor Jason Sidwell and Guitar Techniques's Editor Neville Marten? 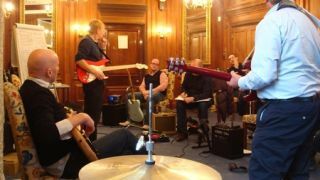 Courtesy of Guitar Break, there are two events on offer that focus on blues rock styles. The first is a one dayer at Bristol's Park Centre on 22 October and the second is the regular end of year weekender at Barnet Hill in Guildford, 3 and 4 December. Each event will feature hands-on playing with technique and theory featured alongside band scenario jams and song analysis. From pentatonics to modes, Clapton to Carlton, 7ths to altered chords you're guaranteed to be a better player afterwards. For more info, free tab downloads, backing tracks and to book visit guitarbreak.com.